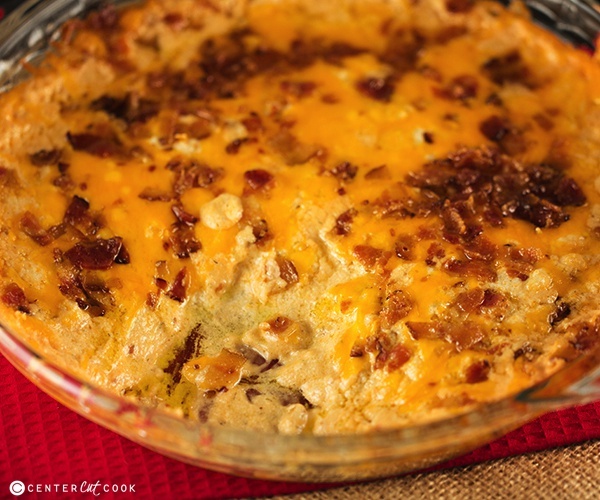 Bacon Cheddar Dip: Extra sharp cheddar cheese is combined with lots of bacon, cream cheese, sour cream, mayonnaise and just the right seasonings. 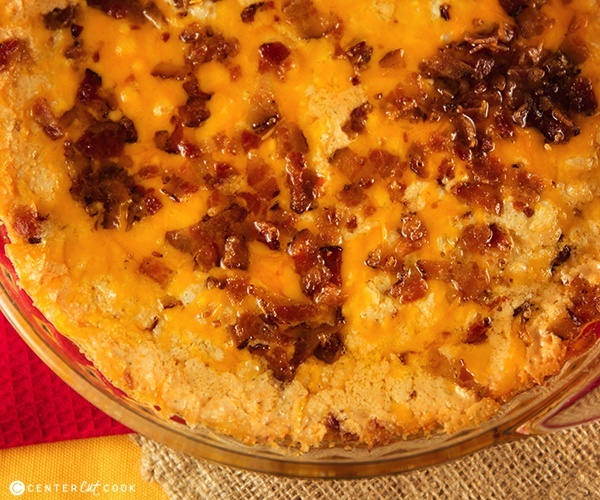 Then it’s topped with more bacon and cheddar cheese, and baked until warm and bubbly. When you have a batch of fresh buttery mini pretzel bites, it’s a requirement to have a fantastic dip to go along with them. Taking inspiration from the cheddar bacon dip I bought from the store months ago, I decided to make a much better tasting homemade smokey bacon cheddar dip. 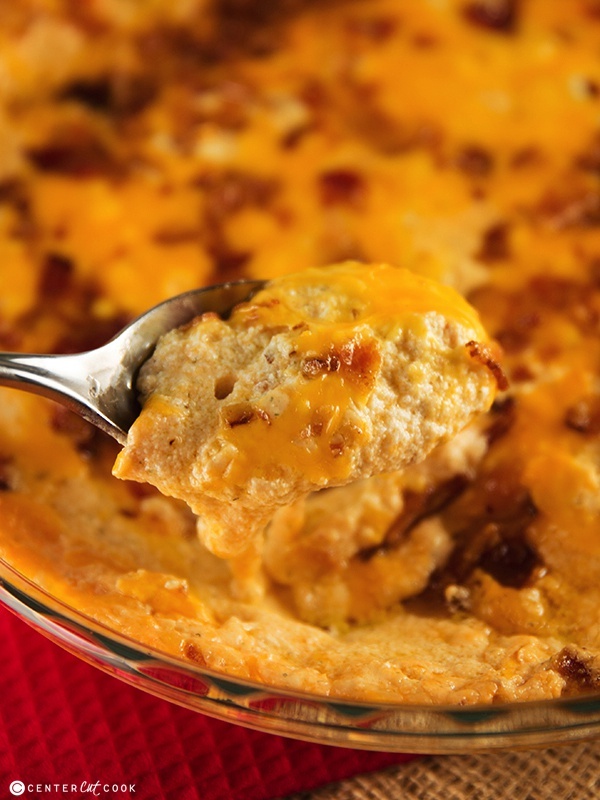 In short, extra sharp cheddar cheese is combined with lots of bacon, cream cheese, sour cream, mayonnaise and just the right seasonings. Then it’s topped with more bacon (because everything is better with bacon, right?) and cheddar cheese, and baked until warm and bubbly. I had every intention of making this dip and pretzel bites to share at a birthday party this weekend. Unfortunately, there was a whole day between the party, and when this dip was made, and let’s just say that between Ryan and I, this dip didn’t have a chance of lasting that long! A little taste turned into bite after bite and ended up being eaten as lunch AND dinner, and there was nothing left by the end of the day. Oops! Being that this is called “Smokey” Bacon Cheddar Dip, I should probably clue you in on what makes this taste smokey. The secret ingredient? Liquid smoke. If you haven’t used it before in your cooking, it’s usually sold in little bottles in the condiment aisle and typically gives meats the smokehouse taste. 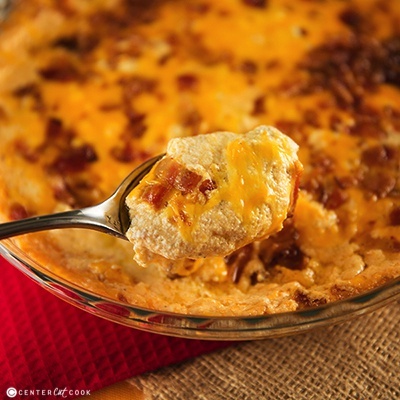 It works perfectly in this dip to give it that smokey flavor that goes great with bacon, and extra sharp cheddar cheese. You could omit it, but I highly recommend including it! *Remember to shred your own cheese. It ALWAYS melts much better and tastes fresh. 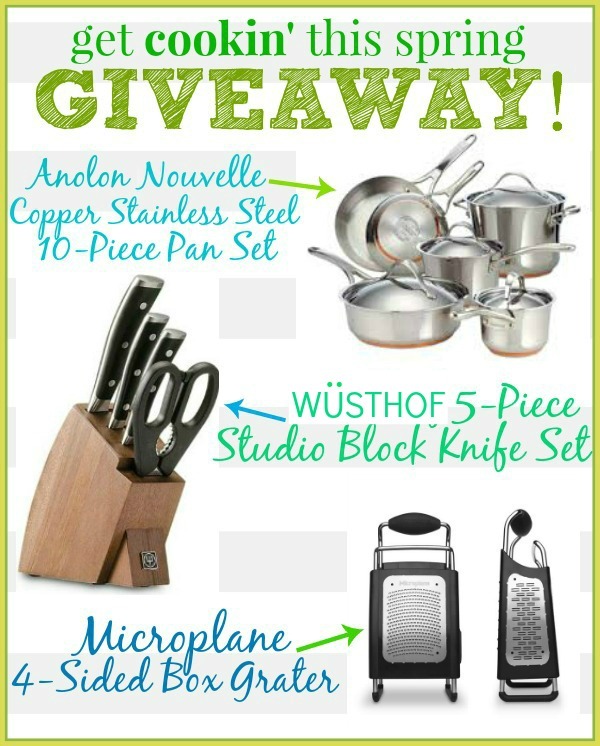 The giveaway has ended. Congrats to the winner, Katie! In your food processor, or using your mixer, combine cream cheese, sour cream, mayonnaise, liquid smoke, worcestershire sauce, dill weed, garlic powder, and onion powder. Add in 1/2 cup of extra sharp cheddar cheese, and 6 slices crumbled bacon. Mix until everything is incorporated. Spread mixture into the bottom of a pie dish. Top with remaining 1 1/2 cups of cheese and 6 slices of crumbled bacon. Bake for 20 minutes or until dip is warm and bubbly. Serve immediately with pretzel bites or dippers of your choice.